Large goods are often transported on pallets. 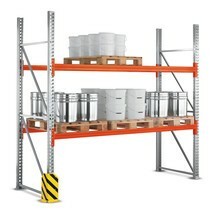 Storing these in a suitable rack will optimise your warehouse processes. 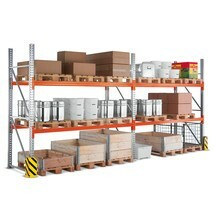 The META pallet rack system can also be expanded with add-on units to suit different requirements. 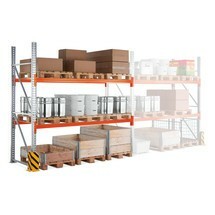 The back stop for the META MULTIPAL pallet rack ensures that the pallet does not project over the end during loading. 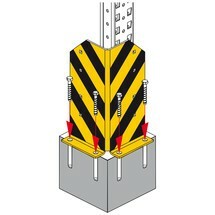 It improves safety whereby the back stop should not be used as a pallet stop. The rear panel grid for META MULTIPAL racks can be permanently, safely and easily attached using this mounting set. One mounting set per rear panel is always required. The surface is durable thanks to the galvanisation. These load-bearing pallet support beams facilitate the easy crosswise storage of Euro pallets. For this purpose, integrate the pallet support beams for META MULTIPAL into the respective rack levels of your warehouse system. This galvanised steel panel with a load capacity of 100 kg is for the META MULTIPAL pallet rack. It is suitable for the storage of small containers or boxed goods. It is not suitable for pallet storage. The levelling plate for the META MULTIPAL pallet rack enables you to compensate for uneven floors and bring the rack to the horizontal. It is shaped in such a way that it can be inserted without protruding so that it does not interfere with the operating procedure. The rear panel grid for META MULTIPAL pallet racks ensures the safe retention of your stored goods on traffic routes and in work areas. The rear panel grid complies with the statutory directive DGUV 108-007 (German Statutory Accident Insurance). Complies with the statutory directive DGUV 108-007 (German Statutory Accident Insurance). Complies with the statutory directive DGUV 108-007 (German Statutory Accident Insurance). This angle beam which is resistant to deformation creates an additional storage area in your pallet rack. The rear and lateral raised edges serve as back stops, ensuring the stable retention of your pallets. 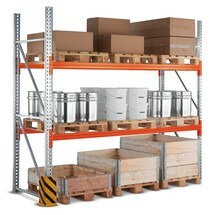 The META Holm is a worthwhile addition to the MULTIPAL range of pallet racking. The support beams can be integrated into your storage racks, creating shelves for your goods which are able to withstand significant loads. 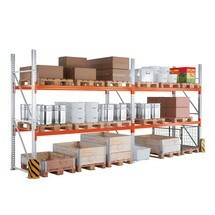 The chipboard shelf for the META MULTIPAL pallet rack is suitable for box and carton storage in the order picking area. The surface is natural and a centring plate for the beam is included. The spacer for the MULTIPAL pallet rack from META is required for the installation of double racks and creates a uniform distance.